Swifty™ is Origin Instruments’ pocket friendly, USB switch interface. Its small size belies its full feature list and high performance. Swifty's universal ability to work with practically any host computer, tablet, smartphone or Speech Generating Device (SGD) means you only need one switch interface for practically all your switch scanning requirements. If your computer supports it, Swifty supports USB Remote Wakeup. Even if you're not using Swifty for access you can use it to wakeup your computer. Tired of that loud fan? Let your computer go to sleep— Swifty can wake it up whenever you're ready to go! Swifty can automatically detect a 3.5-mm (1/8-inch) mono or stereo plug, no need to configure for a single or dual switch. For the busy professional or overworked parent this feature will save time and eliminate many opportunities for confusion. Just plug in your switch(es) and let Swifty figure it out. If you're looking for an iPad, iPhone, or iPod touch switch interface check out Tapio. It builds on Swifty by adding additional iOS specific modes to a proven and reliable switch interface. 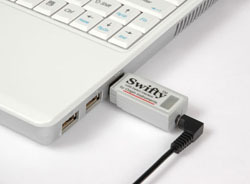 Swifty is a lightning fast USB switch interface in a convenient package. Working with up to two wired, or three wireless switches with Beam™ this compact powerhouse can output mouse clicks, joystick buttons or keyboard characters. Swifty accepts industry standard 3.5-mm, stereo and mono plugs for directly connecting up to two adaptive switches. For connecting two mono switches (such as Orby) use our special splitter. It has two mono jacks for the switches and one stereo plug for the Swifty. Swifty is powered from the USB host device so no external power is required. Swifty utilizes standard USB Human Interface Device (HID) drivers and works with Windows, Macintosh and Linux computers, Chromebooks, Android tablets and smartphones, and most Speech Generating Devices (SGD). 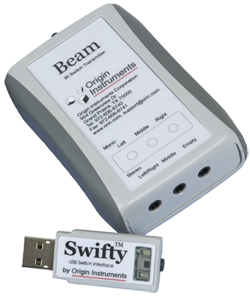 Swifty includes an integrated wireless receiver for communicating with Beam.™ Users can connect their adaptive switches to Beam for wireless communication with Swifty and untether themselves from their computer. Beam also has an additional input for supporting up to three adaptive switches. There is no special software to install for configuration, just select mouse buttons, joystick buttons or keyboard characters using one simple DIP switch. In the photo above switch number 1 is on the left and up is ON. * Up to two switches can be directly connected to Swifty and up to three switches can be wirelessly interfaced with the optional Beam transmitter. Set Switch 3 to ON when using a single switch. Set Switch to OFF when connecting two switches using a stereo adapter. Starting with Model SW2 switch 3 can be ON or OFF, Swifty will automatically determine if a stereo adapter is in use. Switch 4 is used to disable the infrared receiver. * – The stereo-to-mono adapter allows two single switches with mono plugs to be connected to Swifty, Tapio, HeadMouse, or other 3.5mm, switch adapted device. Need an attractive and durable switch? Teaming Orby with Swifty enables users to generate mouse clicks, joystick buttons or keyboard functions with simple taps on Orby.